The lazy days of summer are here and we are loving it! The summer crops are planted, my flower beds are resting, and my daughter is home. my master is in shambles. will go for it...he can take the farm outside but inside is another story. Those baby chicks in the hall bathtub for over two weeks nearly put him over the edge. I like this headboard from Ballard Designs. I would want to lose the bird and upholster and pipe it in an interesting fabric, maybe a botanical and leave the white wood edge exposed. I like nuber 2 the best. It is cool and fresh looking. What a neat headboard for a farm room. Loads of inspiration in those pix and I'm SO glad I'm not the only one who can't figure out Pinterest! Please tell me when you've got it all figured out! I love the Ballard one too. I have to say I like the bird detail though :/ with linen/burlapish (is that a word?) bedclothes and crisp white sheets, yum~! I love all of them...esp. number 3. I also would like to see the pictures of the chicks in the bathtub. I look forward to seeing the fabulous job you do on the headboard! The bliss of sleeping in any of those beautiful beds is dreamy. Where are the baby chicks? Dropped by for the first time but I will be back, great blog. I'm really thinking I like that white framed tv-- in the second from the bottom! I don't care about having a tv in the bedroom-- and we never have; but When did they come out with with a flat screened WHITE TV? This is new to me! Think of the decorator possibilities! Because after all, almost everybody has one, why not make it white? love these bedrooms-- so relaxing. Hi Caroline - Love all your inspiration up there, you and I have the same taste. My very fave though is the one with the antique mirror against the brick wall...it's pure gorgeousness to me. Wish you happy week in your beautiful farm! Lovely inspirations! Our master bedroom is also the last room to get done. It's furnished the way we want; I just need to redo the walls. I want to stencil them so I know it's going to take forever :). Your new summer header is very pretty. My blog Amish Stories is having its first ever contest this week. The First prize winner will win 2 tickets to tour the farm where the 1985 move "Witness" staring Harrison Ford and Kelly Mcgillis was made in Strasburg,Pa . This farm is now Amish owned, and the family has given permission for folks to tour their farm. This may be the last time anyone will be able to walk and see the same things that Harrison Ford and the other actors saw during the making of "Witness". The Witness tour should last about 2.5 hours. In addition to the Witness farm tour tickets, 1st prize winner will also receive 2 tickets for Jacobs choice. There will also be a 2nd place prize, which will be 2 tickets for the Amish Homestead. Please go to My blog www.AmishStorys.com for contest details, and more information on the prizes. Richard from the Amish settlement of Lebanon county. Pretty, pretty inspiration. I just popped over from my stats, it's so great to meet you! I wish I could have chickens here but we're in smack dab of our little town and I don't think my neighbors would like it. I hear they're fantastic to have though and not a lot of work. Oh my gosh, could you be cuter?? Thank you SO MUCH for your incredible comment on m grocery post - I hope you don't mind but I am going to directly respond to it in my next post... I am working on it this evening. As soon as I am done I am coming back here - your blog is FABULOUS! I'm loving the second photo! The colors are so relaxing- perfect for a master! And I think the look of the first one would still be gorgeous without that specific headboard. I love that idea, though! Thank you girls for all your get input! These are great inspirations! I just signed onto Pinterest - looks interesting I hope to get the hang of it soon myself - that galvanized headboard is amazing - very country chic! Looking forward to seeing what you choose to do! So many wonderful rooms, so much fabulous inspiration! I know I'm inspired. 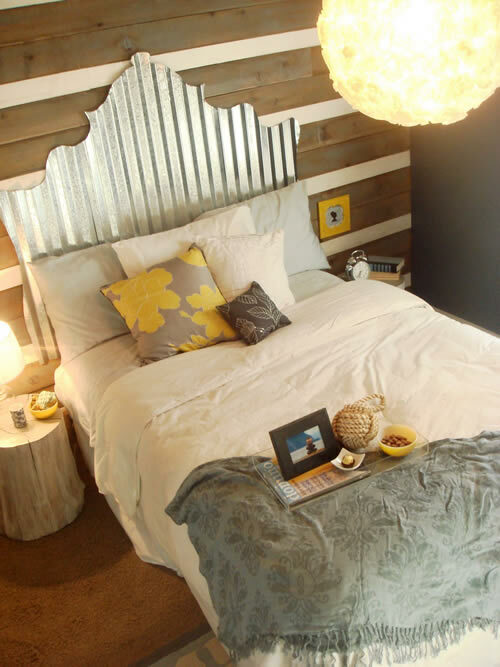 My only suggestion with that fabulous galvanized metal headboard would be some kind of edging to protect from cuts. The finest filing does not get the tiny metal splinters from appearing. 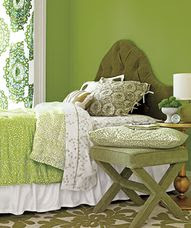 Maybe a rolled edge...love the leaf decor idea for the bed. I see I'll return for more eye candy. Thanks for letting me stroll through your dream. Love the idea of upholstering this Ballard headboard! Dreamy! The shape is so unusual.... love it! Beautiful images . . . I'm in the process of changing out my bedroom, too. Sometimes you just need a new look, ya know?! Thanks for sharing your inspiration. Well, you know Caroline, I would take any of them! All an inspiration and I need a re~do!